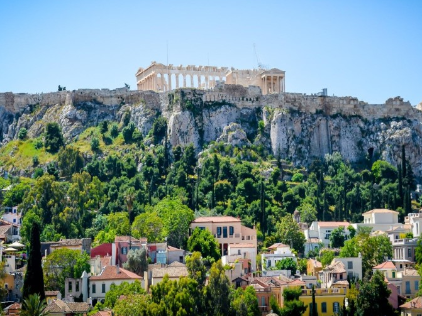 This Athens food tours takes you on a private 4-hour walking adventure to taste some of the delicious treats on offer. Visit local stores selling the "Green Treasures" of Greece, such as olive oil, wines, mushrooms, herbs and traditionally made pastas and salamis. Start with a traditional Greek breakfast of koulóuria (sesame bread rings) in a century-old café, and then make your way to a tiny pastry shop to sample loukoumades (Greek donuts) and custard-filled filo squares. Enjoy local pies and cheeses at authentic Greek bakeries and cheese stores. Next, wander through the meat and fish market, the living monument markets of the city. Try some home-grown and roasted coffee, and visit specialty shops to purchase fresh fruit, olives, cheese, ham and other deli produce. Enjoy some local wine, organic produce olive oil and honey, seven years old aromatized vinegars and the world famous Greek yogurt produced at family farms, at a small shop that sells awesome gifts for your friends back home. Wander down Evripidou Street, scented by herbs. Try organic olive oils at a small shop that sells awesome gifts for your friends back home. Then end your culinary exploration at the deli stores of the historic city center where your tour guide will make you complimentary gifts to take back home.